At Kensho Life we provide practical training, strategies and a community to help you develop emotional intelligence, personal growth and well-being in the modern world. Through a wide range of techniques, our Integrative Mindfulness approach is flexible and adaptable, allowing you to incorporate the practices in your day-to-day, regaining more freedom, autonomy and control over how you want to live. We know from our own experience that it’s possible to design a happier, healthier world for yourself as well as those around you. what makes kensho life different? INTEGRATIVE MINDFULNESS. Mindfulness based practices for groups and individuals, complemented with the latest knowledge and techniques from the fields of Positive Psychology, Cognitive Behavioural Therapy, Neuroscience and The Science of Happiness. COMMUNITY. This is key for you to continue and expand your practice through regular meetings, group meditations, training, activities, discussions and great coffee-infused sense of humour! A RELAXED SPACE WHERE EVERYBODY IS WELCOME. All our courses and meetings are secular and universal, we are fans of human diversity so we welcome all religions, beliefs, ages, abilities, races, sexual orientations, ideologies and anything else we might be missing. If you’re human, you’re in! OUR OWN EXPERIENCE. The most important lessons we’ve learnt have been through making challenging decisions and putting them into action. We understand the emotional and personal difficulties you might encounter and we also know that with the right tools, care and guidance, you can overcome whatever obstacles come your way. 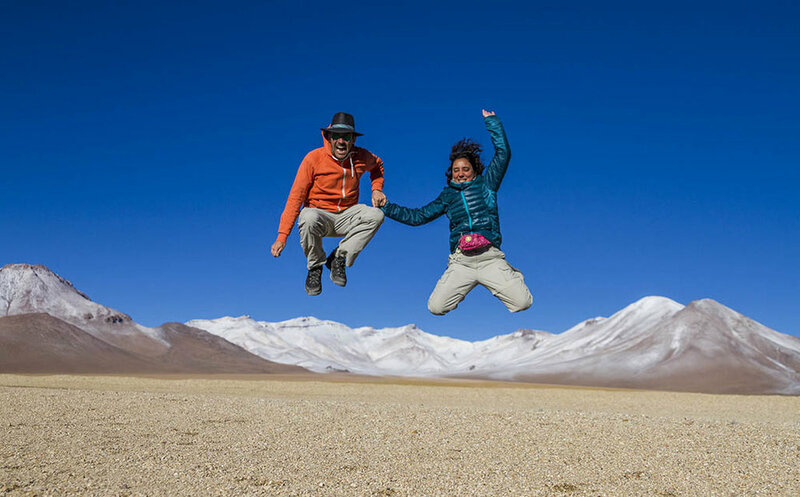 We are Veronica and Enrique, a (still) happily married couple and founders of Kensho Life. For us, Kensho Life is not about making a living, it’s our way of living. Years ago, whilst living in London, we looked at our lives and realised that despite being successful (as commonly understood: money, status, travels, highly demanding jobs with good prospects...), we were stressed and often tired and grumpy. Changing careers and getting more money didn’t fix the problem and we were close to burnout. Something had to change. In our search for a solution we stumbled upon mindfulness and although initially doubtful, we decided to give it a go. Little did we know that would be the beginning of a life-changing journey that would take us to drop everything we had, quit our jobs, sell our beautiful house and take off to travel around the globe volunteering in other people’s projects and dreams, experiencing first hand how it’s possible to choose to live true to yourself, in line with your values, your dreams and your own expectations. But, How do you know if you’re living true to yourself? This is how Kensho Life came about. Kenshō is a Japanese term where Ken- means ‘seeing’ or ‘vision’, and -shō means ‘nature’ or ‘essence’, and it translates as seeing your true nature. In order to live true to yourself, it’s essential to understand your own true nature, to know yourself. Meditation combined with other practices and techniques, allow you to investigate and find your own Kensho, to see yourself with more clarity. It is from this place only that you can live true to yourself. And so here we are, we’ve made our Kensho to help others find their Kensho! Enrique has a talent for both applying logic and structure to a situation, while extracting stress and ego in order to help you to perceive your goals with absolute clarity. Prior to Kensho Life I worked in London as head of production and post-production of commercial videos, as account manager and online brand strategy consultant for multinational organizations and global brands, and as a mentor for freelancers and small creative companies in the media industry. While working I also founded and led several non-profit projects on the side, one in South London (Southwark) training transferable skills in film and video making for young people from deprived or socially excluded backgrounds and people with disabilities, and a monthly event of short film screenings and talks for film professionals and amateurs that run for 7 years in various central London venues. I hold an international certificate as Mindfulness Master Practitioner and have an extensive meditation practice with masters in the UK, Bolivia, Canada and Japan. Veronica’s deeply caring, sensitive and compassionate character created a trusting and welcoming space. Her creative fun loving yet pragmatic and realistic approach enabled our son to appreciate and use his strengths, supported us parents to tackle the adversities of parenthood and helped us all to a more harmonious family life. - Viktoria Steinhoff. Advanced Nurse Practioner. I have over a decade of experience in consultancy and support for families with members with disabilities and life-long illnesses and I am trained in specific interventions to support people with special needs (TEACCH, SCERTS, Talking Mats, Makaton Signing, Inclusive Storytelling). Prior to Kensho Life, I worked in London as an Art History Teacher, Special Needs Teacher, Autism Consultant and Outreach Teacher for the Boroughs of Southwark & Lambeth, Freelance Inclusion Consultant and Graphic Designer. I also volunteered in activities to facilitate the inclusion of people with disabilities in the community.